So many things going on and I just needed a total brain shift. Way too much light coming in on the work but it was the best I could do for a quick image. 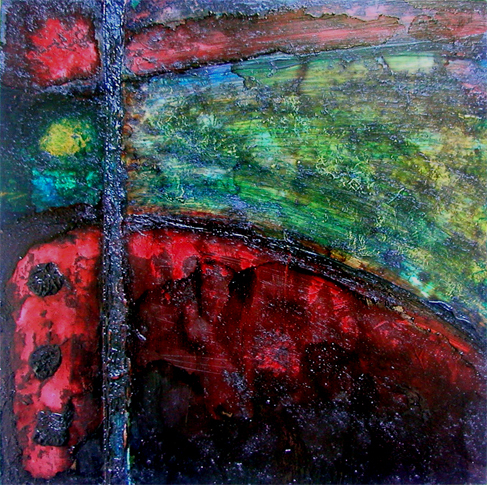 6″ x 6″ (15.2 cm x 15.2 cm) claybord with acrylic and alcohol ink, fiber paste. It’s not finished at this point. Also abstract but really not that much fun. Now, with a nice G & T it would be loads of fun! I don’t feel the urge to change professions right now. 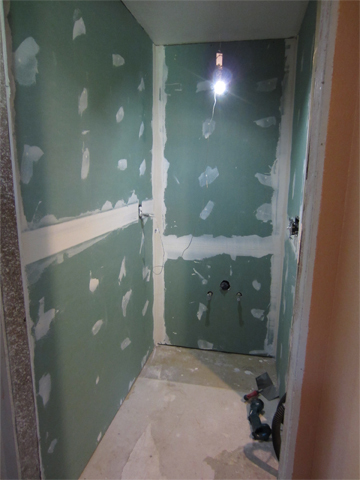 I’ll be happy when this bathroom is completed! I like the colors in that image. Wow! A Chris comment! I’m impressed! Well, it’s already gone through some other changes so it doesn’t look like before. There are 3 in the works and I keep swapping them around. I’ll post more pix tomorrow. Hope you’re well and keeping out of trouble! Mmm, scrumptious colorful work Gale!